Shark came out tops yet again with this model - i love the fact that the suction power gets even the most stubborn hairs out of the rug and car , thanks to duo clean motorized brushes that pick up even the smallest of dirt - as you can see we have hit the dog shedding season- see the photo of the brushes after the vacuuming and if i didnt clean the house - it becomes a one huge mess - it is safe to say that Shark manages to pick all the hairs up with ease. The dust bin is large enough for storing all the dirt and debris that gets collected , and bin is easy to detach from the whole unit and with one touch you can empty it out . Its also very light so it is handy for my disabled husband to use it- as for the ease of use - it is as easy to put together as it is for separating it for all the jobs that needs doing , - the unit comes out of the base , and you have a range of attachments provided to tackle jobs around the house - in the box you will get a 20cm Crevice Tool ,Dusting Brush ,Wide Upholstery Tool as well as storage bag for all the accessories . Shark yet again can reach all the nooks and carnies on the floor as well as above your head . 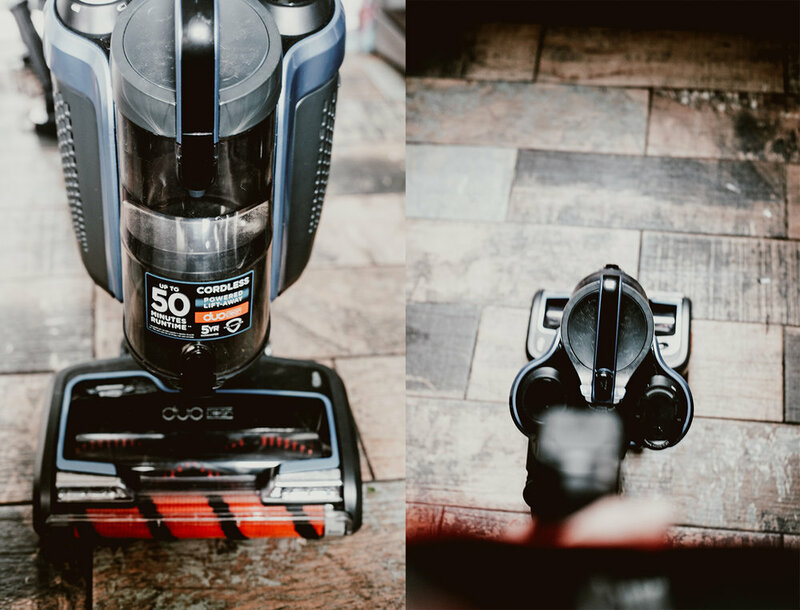 You might wonder if this handheld vacuum should be your next purchase - let me tell you something - since arriving into our home this baby have been ever so helpful with those jobs where i just cannot be bothered to take a sweeping brush ! - from kitchen table crumbs to my sofas and dogs hairs on it and the car- if you got kids and they are hungry while you are driving you will know how the back seats of your car will look like after any trip ! - this is why i simply adore this shark handheld. it is also light and very easy to use . Its run time is 10 minutes , but it also recharges quickly . Did i mention that it also looks super stylish ? This handheld comes with 2 attachments - the Crevice Tool with Dusting Brush that neatly folds over the tool and a Pet Multi Tool to tackle the jobs- you can also use it as it , its cordless so you wont have to worry if you got a plug socket near by . T he clever thing about it is that the stand it comes with is also a charger ! - the vacuum slots in its stand and charges , there is also a space for the 2 attachments so you wont have to worry that you will lose them .This handheld is also preety good at collecting saw dust ( dont ask just take my word for it - it works - in our home this handheld took a permanent spot in our teen daughter room and she is using it the most - safe to say her room is actually kept clean from all the pencil shavings that usually are everywhere and to actually see a clean desk and floor -that says a lot ! This handheld have a great suction power and for its size it has also a good sized dust bin that it can be emptied at the touch of a button , we love it ! Shark being a very cool brand kindly donated a brand new Shark DuoClean Cordless Upright Vacuum Cleaner with Powered Lift-Away IC160UK worth £449.99 and a Shark Cordless Handheld Vacuum Cleaner [Single Battery] WV200UK worth £129.99 For one of you to be able to finally see a difference when it comes to easiness of keeping your home clean ! - how cool is that !